Many games present you with a character that you control and experience their life story through their eyes and their feelings. But few storytelling games, such as Her Story and an android game experience called Sara Is Missing, try to change this idea and instead of you controlling a character, you become the character and you unravel the story as you do the actions in the digital world. A Normal Lost Phone is another one of these games, so let’s dive into how good is this experience. 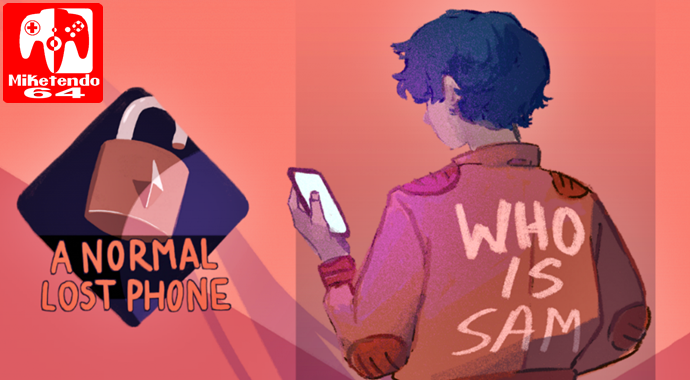 Developed by Accidental Queens and releasing on platforms such as Steam, Android and iOS, A Normal Lost Phone has made the transition to the Nintendo Switch and to celebrate the occasion, new features have been added to create an experience akin to the unique one on smartphones. To talk about the story in this kind of game can be critical as most of what I talk can lead to spoilers. But the general idea, is that you find a cell phone in the street that belongs to a boy who has disappeared on his 18th birthday. By looking through his phone, you will soon discover what happened to the boy and why he disappeared in the first place. The way the story progresses, it’s not long before it ends up dealing with a very important social topic and introducing the player to what it is, its characteristics and how some people in the society reacts towards this topic. As for the way the story develops, is by reading texts and, although there are text boxes that don’t really mean so much, most of it helps you understand what happens in Sam’s world, which is something I happened to appreciate. Another thing to praise is that the developers took their time to listen to people that are deeply connected with this topic and you will see a lot of what they said reflected in a specific section of the game, which led me to learn more about this topic and be more conscious of something that I didn’t know so much about as it isn’t part of my everyday life. I think that what they did is an excellent way to spread the knowledge and help others accept it more easily. On the other hand, the gameplay aspect of this game isn’t for everyone and will probably only fulfil the necessity of just those looking to experiencing this interesting story. The gameplay revolves around the idea of reading through texts (and when I say this, I mean a lot of texts) that can be messages, emails or publications to learn more about Sam. To unlock new areas, you have to solve small puzzles like discovering the password of the public Wi-Fi or the password of a dating app, but all of this can be easily solved if you read every nook and cranny that you already had access or just got access. Unless you are willing to read a lot and pay attention to details, this might not be the game for you. To experience this game, you have 2 options: you can play using the Switch controllers in either modes or, when undocked, you opt to use the touch-screen controls. Using a controller isn’t the best way to play, as you lose the idea that is you checking the phone, because now you just give the inputs, like in a normal game, but it is an acceptable way to play if you want to opt for the TV experience instead. However, A Normal Lost Phone is meant to be played as a handheld experience by using the touchscreen. This way, the game really provides the feeling that it wants in an almost flawless control scheme. Visually, this game tries to reproduce the interface of a normal smartphone that we can find these days, but they decided to make everything as if it was drawn, which gives a familiar and yet different look to it that I enjoyed. I only wish they had adapted it well when playing horizontally as there is so much screen space wasted. To complement the visuals, the music is implemented in a clever way. The soundtrack includes many different songs and are played as if they are coming from the phone’s music app. This is interesting as you have control over which one plays, you can shuffle them or even turn them off. They are there to give you an insight into the musical taste of the phone’s owner, but they can feel out of place a few times. Furthermore, A Normal Lost Phone can’t be replayed once beaten, as when finished, you will pretty much have read and seen everything this game has to offer, so when you do beat it, there’s a good chance you won’t touch it again. Another point to consider, is that this version is a bit more expensive than previous. Yes, it adds the HD Rumble to imitate some of the vibration responses of a cell phone and is adapted to work with a controller, but I don’t think these additions justify the price being twice as much for Switch. Finally, one very important thing to note about A Normal Lost Phone, is how it makes us think about a detail that we normally don’t think: How our cell phone contains a lot of information about our life and a person with access to it, can have almost total access to our photos, messages and secrets. But that is something that I wanted the game to acknowledge more. The game’s idea is to search the phone and you end up having no consequence for invading the privacy of another person, as if this was an acceptable thing to do. A Normal Lost Phone isn’t a game for everyone. Nor is it the best game you can get on his range of price, but it is an interesting experience that made me reflect on 2 serious topics and learn more about one of them. If you are interested in a short story experience that requires your attention and focus and that isn’t that much expensive for what it offers, then this game is for you. If not, you can find other experiences on the same range that will please you more than this one.